Do you take this USB—to have and to hold? As a photographer with roots in the chemical-age of film and prints, it has been an adjustment to transition to the current cloud-culture of clients that now require photos be sent digitally so they can be viewed and shared on their phones (don’t get me started on company firewalls that block photo gallery sites). Over the years I have seen the spectrum of file and photo delivery evolve almost on a yearly basis, while camera sensors continue to grow in shear pixels while at the same time as personal computers slowly phase out disc-drives. We are all familiar with the trend of read/write CD’s from 700 mega-bit, to DVD’s that fit 4.7 GB; and the brief Blue Ray disc (with 25 GB per-side) plateau for storage on an magnetic disc (think Beta VHS player’s from the 80’s that also went the way of the dodo—I won’t get into optical discs, but they never really took off either, and died shortly after DVD’s became the standard) Also, I would be remiss if I didn’t mention the life-changing 100MB Iomega Zip-drive discs that many graphic designers and print-production folks fondly remember. Today, many new PC’s and laptops don’t even have built-in disc drives—so what is a digital photographer in 2018 to do? Yes, many hosting sites, as well as commercial delivery sites, such as Dropbox.com and WeTransfer.com have offered free delivery for digital files for years, which is fine for nuts-and-bolts get-it-to-the-printer-asap kinda jobs. I have personally relied heavily on Zenfolio.com to host literally hundreds of thousands of high-res photo files so that customers can download and order prints—and that has been fine for the last 10 years or so. But for something as special as wedding photos, how do we as photographers deliver some of the most precious moments to people? I have a drawer-full of back-up copies of CD’s that I have imprinted inkjet labels with carefully selected photos that I have mailed to couples (not knowing at the time, but suspecting that discs are going the way of the digital dodo). USB drives in 8GB and 16GB and beyond, have now become the physical storage standard archival choice for shear digital capacity—as nano-technology becomes a reality—for what we capture as modern photographers. So how do you package and present a special day into one small, yet immensely large digitally important package? 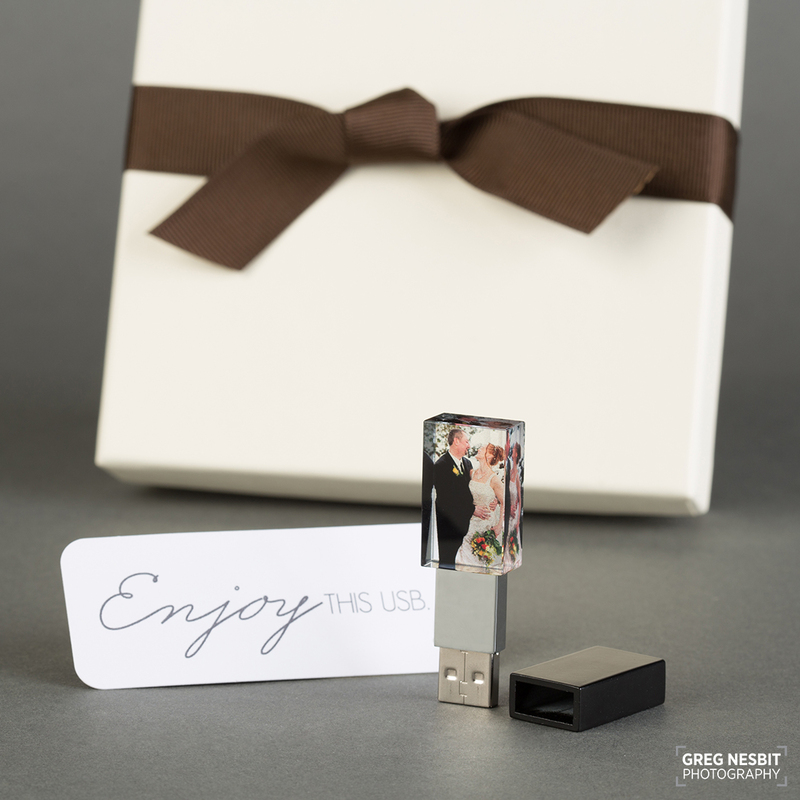 I recently ordered a USB via Miller’s Lab (a professional photographer’s resource) to print this couple’s favorite photo onto an acrylic block attached to their wedding photos USB. This does not replace custom-designed albums and prints, as well as a host of other print products—but for now (as of today anyway) this is a pretty cool and, well just pretty way of delivering a special day indeed. BTW, congrats Nikki and Shawn! p.s. as a father of two amazing boys and a wife that I can’t imagine living on this crazy planet without, I often make pains to print my most favorite digital images of my family (we call them fridge-pics). I would encourage strongly that everyone reading this to print (yes print!) your favorite family photos. Not saying that an atmospheric electromagnetic burst is going to happen tomorrow (Although, it seems likely with the current administration more and more each day), however lightning happens all the time, so back up your photos on paper!